Thanks for taking the time to read my article on the best garden digging fork. If you are new to gardening, there is an assumption that all garden forks are roughly the same type of fork, and do the same job..
That isn't actually the case as there are a number of different types. There are, believe it or not, ten different types of garden forks. The reason that we mention this so early in this article, is because we want you to be sure that you are buying the right one. In this article we show you the different types of garden fork that are available. 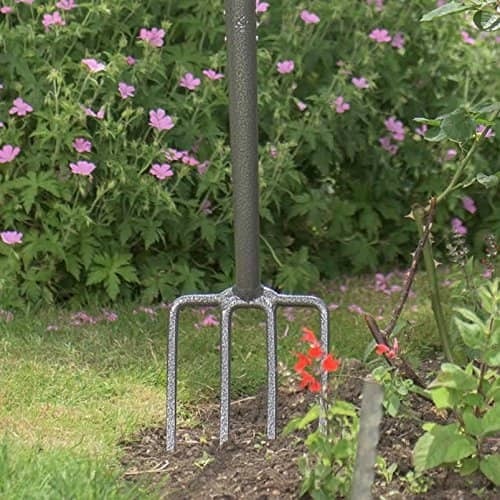 We then show you what we believe to be the best garden digging forks, and have created a top list based on actual online buyer ratings. We have then done a summary review of each garden fork on the list. The prices range from about £9-30, so you should be able to find a fork that suits your wallet. What Digging Fork Do You Need? To help you decide which is the right type of fork to buy, we have included a short table below, that explains the different types of garden forks available, and what they are used for. In this article we are going to focus on the best digging forks for gardens, and which types of digging forks are the best to use. The big question we want to answer here is what actually makes a good digging fork, and one that is especially suited to digging up gardens, and for general fork work in borders and garden beds. A hand fork - this is mainly used for weeding on borders and beds, and you can also get these with long handles, or with long shafts. We have described these in more detail below, just so as we can make it clear what the differences are in these fork types. We also include the benefits and drawbacks of using one type over another. Below I have given some more detail on the three different types of forks that can be used in the garden, for general digging and/or weeding purposes. This is the one that most people will be familiar with. This is classed as the general purpose garden fork. It can be used to dig borders but can also be used on larger flower beds, and on vegetable gardens. These garden forks typically have four, strong tines (prongs) and a long handle. They can deal with any type of digging. It is also worth noting that they are great for working on soil types that are made from heavier clay. The border fork is slightly smaller than a garden fork. That makes them much lighter than a standard garden fork, and are also much easier to handle and use. They are perfect for working in what are classed as tight spaces. That of course includes borders and raised beds. They are also ok to use on smaller flower beds. As a side note these are also a better choice for those who are no longer as fit as they used to be. I am just over 60 now and a smaller fork like this is a perfect choice for digging borders. As they are lighter you just won't suffer as much from user fatigue, as you would from handling a larger and heavier fork. The hand weeding fork is a good choice for getting down close to the border and removing weeds. They can also be used to break up the ground just before planting. We have summarised those three options in the table just below. In the remainder of this article we shall focus on the standard digging fork. If you want to read about the other types, then please click on the links in the table to read about those. A great general purpose digging fork that is suitable for all types of digging in beds and borders. Similar to the digging fork but smaller and lighter, and suitable for lighter digging. So as you can see you have some choices to make. However, if the fork is going to be used for general purpose digging, then you will want to buy a standard garden digging fork. That type of fork is suitable for all types of digging, be that vegetable beds, flower beds, raised beds and borders. My strong advice is therefore to spend just a little bit extra on your purchases, and buy forks that will last. In other words they won't bend, break or rust. Below we have listed a good quality range of garden digging forks, and have ranked those by showing the highest buyer rated first. These are ratings that have been given to these forks, after they have bought and used the product, and then taken the time to leave an online review. We express this as a percentage scored out of 100%. You will see that rating in brackets, just after the product name. If you click on any of the product names, you can read a summary review of each fork. Just below we have completed a summary review of each of the 10 products on our top 10 list of garden digging forks. After those reviews we have also included a full and detailed buying guide, which is specific to garden digging forks. Hopefully we have provided you with enough information to be bale to make the best choice for a digging fork that will suit your needs. There really are lots of choices to be had, and we have picked out what we believe to be the top 10 according to many online buyers. Any fork from Fiskars or Spear & Jackson will be a solid reliable choice, though you will pay a little bit more for these. They are however made to last, and they are also better designed in our opinion. If you only plan on doing some lighter digging, then one of the cheaper models priced at under £15 will do the job, providing you won't be using a garden fork too much. If you are willing to pay anything between £25-30 for a good quality digging fork, then you should expect that fork to last you for years.